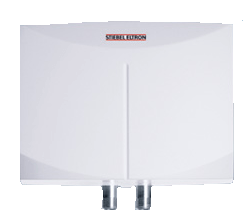 We are pleased to offer a full range of point-of-use tankless and mini-tank water heaters to suit almost every point-of-use water heating application. Applications include bathroom sinks, kitchen sinks, utility sinks, dishwashers, staff lunch rooms, emergency eyewash stations, pre-heaters for small dishwashers, restaurants, fast food outlets, cafeterias, hand and hair washing sinks in spas and beauty salons, and any other small domestic or commercial hot water heating task. 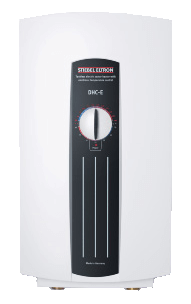 A wide variety of models are available in both tankless (on demand / instantaneous) and mini-tank designs. See chart here for model selection recommendations based on flow rate and climate zone (incoming water temperature). For larger flow rates, all whole house Tempra and Tempra Plus models can also be used for point-of-use applications. Point-of-use tankless water heater with the same flow-based power modulation technology found in the flagship Tempra Series. Models up to 12 KW. The DHC-E series are an excellent choice for point-of-use applications where flow rates or water pressure may vary or where very low activation flow rates are required. 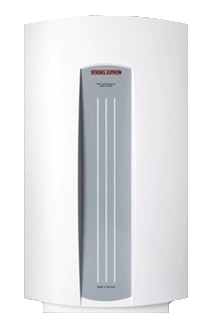 Economically-priced point-of-use tankless water heaters with up to 10KW of power are suitable for almost all point of use water heating applications. 110/120 volt and 208/240 volt models available. Best suited to single applications with a relatively consistent water flow rate and pressure as they are not thermostatically controlled. Economical model designed for low-flow point of use applications in warm climates. The Mini Series Tankless are most suited to applications where the flow rate does not fluctuate as they are not thermostatically controlled. Their ultra-compact design saves space and allows them to be installed in very confined areas right next to the application. Very economical. Excellent choice where only 110/120v power is available and water is used infrequently. Space saving design. Available in 2.5 and 4 gallon tank storage capacities. 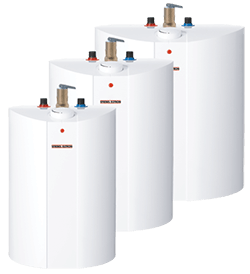 These Mini-Tank Water heaters work best where only small amounts of hot water are needed at a time. Also recommended for use in hot water re-circulation systems. Similar to the Tempra Series, the Tempra Plus models are also frequently used for higher flow rate point-of-use applications. 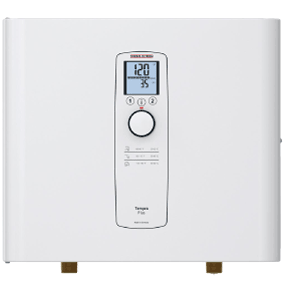 Tempra Plus models are the most sophisticated electric tankless models available today - featuring exclusive Dynamic Advanced Flow Control Technology which limits flow rate when the unit detects a flow demand higher than its capacity.